Jesse Chambers is a fictional character appearing in American comic books published by DC Comics. Chambers, who first used the superhero name Jesse Quick and later Liberty Belle, is the daughter of Golden Age heroes Johnny Quick and Liberty Belle. She inherited both of her parents' powers. A version of Jesse Chambers renamed Jesse Wells appeared as a recurring character on The CW television series The Flash played by Violett Beane. This version was the daughter of the Earth-2 counterpart of Harrison Wells. She was also the speedster of Earth-2 Jesse Quick. The 1992 limited series Armageddon: Inferno re-introduced the Justice Society of America after their disappearance into and re-emergence from the limbo dimension of Ragnarok (where they had been trapped since 1986's The Last Days of the Justice Society). Subsequently, a new Justice Society of America series (vol. 2) debuted. The series' first issue introduced the character of Jesse Chambers. Thereafter, Jesse became a supporting character in The Flash (vol. 2) as Wally West's partner, Jesse Quick. In 1999, Jesse was featured in a lead role in writer Devin Grayson's series Titans, which ran until 2002. After 50 issues, Titans was cancelled and ultimately relaunched in writer Judd Winick's Titans/Young Justice: Graduation Day limited series. Jesse was not part of the new roster of Titans introduced after Graduation Day. Following Graduation Day, Jesse played a small supporting role in Geoff Johns and David Goyer's JSA series, where she served as Rick Tyler's love interest. When the book relaunched in 2006 as Justice Society of America (vol. 3), Jesse was featured as one of the main characters, now going by the name of Liberty Belle. 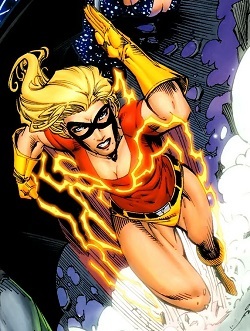 She served primarily under the Liberty Belle name until Johns' 2009 limited series, Flash: Rebirth, where she returned to the Jesse Quick identity. She continued to feature as one of the leads in Justice Society until late 2010, when she was brought over to the writer James Robinson's revamp of the Justice League of America (vol. 2) series. In addition, the character was the star of the Liberty Belle & Hourman back-up feature in JSA All-Stars from issue #2 of the series. Written by Jen Van Meter and drawn by Travis Moore, the series was an action/romance feature which chronicled the adventures of Jesse and her husband Rick as they battled the villainous couple of Tigress and Icicle. The series had its finale in JSA All-Stars #10 in October 2010. In hopes of creating a successor, Johnny Quick taught the formula that gave him his enhanced speed to his daughter, Jesse. The formula worked on Jesse as well and she gained super-speed. However, rather than becoming a costumed crime fighter as her father had intended, Jesse instead opted to continue her education as her mother requested. While Jesse was studying at Gotham University, the superhero team her parents had been colleagues with, the Justice Society of America, reemerged following a long absence. Naturally, her thesis topic became "The Impact of Superheroes on Society" and she began to follow the returned heroes, cataloging their adventures. When her father asked her to deliver some documents to the Society, the encounter would result in her aiding the team as Jesse Quick, finally living up to her father's dream of her being a costumed crime fighter. It was during that time that she met Wally West, the Flash, who would later ask her to be his replacement if something were to happen to him. It was all an elaborate plan on his part, trying to force Bart Allen, Impulse, to take his role in the legacy of the Flash more seriously and be Wally's successor. Although she felt betrayed, she would end up saving Wally's life, though her leg was hurt in the process. When Wally returned from the mythical Speed Force, he healed her leg, and the earlier deception was largely forgiven but not forgotten. When, shortly after, Jesse lost her enhanced speed, the person she blamed was Wally who had been directly using the Speed Force energies instead of simply tapping them like the other speedsters did. In fact, it turned out to be the villain Savitar who was the cause, having severed her connection to the Speed Force, as well as multiple other speedsters. Nonetheless, Wally chose the depowered Jesse to accompany him to Savitar's lair where she succeeded in regaining her powers. During the following battle with Savitar, her father gave his life in order to protect his daughter from one of Savitar's forces and merged with the Speed Force. Although Wally would ultimately triumph over the villain, Jesse was left to mourn her father. Per Degaton told her she would do something terrible, destroying the world. Jesse accepted the reins of managing her father's corporation, Quickstart Enterprises, while also operating as Jesse Quick, even joining the members of the Titans to stop a nuclear threat. When the Titans were later going through a reorganization, Wally, a founding member, selected Jesse to join the roster, hoping to soothe their old wounds. After initially declining the offer, she ultimately joined the Titans, but was only on the team for a short time, feeling herself to be second-best to Wally. Nightwing, another founding member, persuaded Jesse to return to the Titans. Later, Jesse became involved in a murder mystery involving her own widowed mother, Libby Lawrence. The victim was Philip Geyer, Libby's fiancé. An investigation by the Titans revealed not only the killer but also an ongoing affair between Philip and Jesse which had contributed to his death. Although Jesse attempted to reconcile with her mother, the saddened Libby found it hard to forgive her daughter although she apparently did, as in later appearances the two had returned to their friendly relationship. The Titans were disbanded not long afterwards, as two of the team's members were killed in an attack by a rogue Superman robot in the limited series Titans/Young Justice: Graduation Day. Jesse saving Wally West during the battle with Zoom. Following that disbanding of the team, Jesse threw herself back into her responsibilities at Quickstart Enterprises, finding little time for a social life. When Wally would later need assistance to defeat the villain Zoom who was capable of moving at speeds surpassing any of Earth's other speedsters, Jesse lent Wally a portion of her special abilities, temporarily boosting Wally's speed so that he was moving almost faster than light and allowing him to defeat Zoom, but leaving her powerless and unable to remember the formula to access her powers. Although Wally knew the formula, she told him not to remind her, reminding him that he had earlier told her that she needed to slow down anyway. After that, she worked as business manager for a newly reformed Justice Society of America. The JSA successfully rescued her mother, who had returned to her role as Liberty Belle, but whose powers had gone out of control. In that same adventure, mother and daughter reconciled. In Justice Society of America (vol. 3) #1, Jesse had become a member of the Justice Society, carrying on her mother's legacy as the new Liberty Belle. She is now married to fellow second-generation hero Rick Tyler, also known as Hourman. After hearing the news of Bart Allen's death, she, along with Jay Garrick, mourned his demise; her reaction to Wally West's return from the Speed Force is as yet unknown. In an encounter with Zoom, it is revealed that Jesse has retained her speed powers by repeating her father's formula. This adds to her super-strength, which means she inherited both of her parents' powers. In the same encounter, she talks the hero Damage out of murdering Zoom. In The Flash: Rebirth mini-series, an explosion suddenly occurs in front of the pair. Jesse is shocked to see her father Johnny Quick is alive in the Speed Force, as he materializes and begs Barry Allen not to hurt Jesse before vanishing (but he dies later by Professor Zoom's actions). Hourman is tending to Jesse, who (since seeing her father) has begun repeating her father's speed formula over and over. Jesse, now crackling with Speed Force energy, stops repeating the Speed Formula. She reveals that she has finally solved the equation: "Jesse Quick. Max Mercury. Jay Garrick. Wally West. Bart Allen. Barry Allen. The Speed Force." When Wally West's twins Jai and Iris are struck with crippling pain thanks to Professor Zoom, Iris takes Jai's connection to the Speed Force and nearly kills herself doing so. Jesse arrives and recites the now-revealed Speed Mantra to revive Iris, telling Jai and Linda West that Iris is the next generation of speedsters. The two join the battle between the revealed Professor Zoom and the combined forces of the three Flashes (Jay, Wally, and Barry), Max Mercury, and Kid Flash. With the speedsters reunited, Wally uses a trick with the Speed Force, revitalizing the speedsters and transforming his, Jesse's, and Iris's outfits. Jesse dons a uniform patterned after her father's. She returns to her Liberty Belle outfit for a few adventures leading up to the Blackest Night event, but switches to her Jesse Quick identity and costume when she is attacked by the reanimated corpse of her father. Liberty Belle is found by her father, Johnny Quick, who claims that Jesse's love for him was the reason he came back. Jesse says that she has a uniform like his and quickly changes into it by reciting the mathematical formula that her father originally used and calls herself Jesse Quick. The two speedsters then run off. While she is running across the globe with her father trying to enjoy the time she's spending with him, she thinks she should rather be with her husband, the modern-day Hourman. Jesse continues to run with her father, remembering her childhood memories of when they used to jog together around their neighborhood and Johnny would let her win, feeling thankful that she was able to spend only a few moments with him again. Later, Black Lantern Johnny Quick is destroyed by Mr. Terrific's machine that turned off the Black Lanterns' connection to their rings. When the JSA splits into two teams, Jesse remains with the JSA, while her husband Rick went to the JSA All-Stars. However, Rick and Jesse remain happily married, although her teammates and the public at large believe otherwise, forcing Rick to explain their condition as "a working couple working in different offices." At Wonder-Con, writer James Robinson announced that Jesse would be joining the Justice League of America as part of DC's Brightest Day event. This development occurred at the conclusion of the JLA/JSA crossover, The Dark Things, with Batman asking Jesse to join the JLA in order to fill her old friend Wally West's role as the team speedster. During her tenure with the JLA, Jesse gradually begins to lose her speed abilities, and it is eventually revealed that this is due to her becoming pregnant. The League disbands shortly after this, and Jesse leaves to be with Rick. Just like her father, Jesse has powers of flight and accelerated speed, resulting from the state of mind achieved from the visualization of the speed-formula: 3X2(9YZ)4A. Her powers are linked to the Speed Force. She also has her mother's super-strength, enabling her to lift great weights, such as a car, with ease. As with her mother, the mechanism of her super-strength remains unexplained, which irritated her father. She attributes her powers to a "mantra" like the formula used by her father to unlock his speed. She also has superhuman stamina, superhuman reaction/reflexes and superhuman agility. She heals much faster than a normal human, thus, having super healing. Jesse Quick appears in Teen Titans Go! #52 as an alternate alias of Robby Reed. Unknown to both Robby and the Titans, his Hero Dial borrows power from any hero who's in close proximity to him, and thus becomes Jesse Quick when Kid Flash is close by. This Jesse is a boy. A teenage version of Jesse Chambers appear in the Ame-Comi universe as that world's version of the Flash, sporting an Anime-inspired redesign. She makes her first appearance when she teams up with Steel and Robin in order to rescue Batgirl from Duela Dent. In Injustice: Gods Among Us #7, Lex informs the Justice League that he was saved from the Joker's nuclear explosion by an unnamed speedster he had on his payroll who perished afterward. Though she is not identified, she wears a Flash costume and has the same hair color and hairstyle as Jesse Quick. Violett Beane as Jesse Wells / Jesse Quick from the The Flash episode "The New Rogues" (original air date October 26, 2016). Jesse Quick appears in season 2 of The Flash, portrayed by Violett Beane. A native of Earth-2, Jesse Chambers Wells (nicknamed "Jesse Quick") is the daughter of Harrison Wells (Tom Cavanagh), and is held hostage by Hunter Zolomon/Zoom early in the season, forcing her father to travel to Earth-1 to team up with Barry Allen/The Flash (Grant Gustin) and his friends. Later in the season, they successfully rescue Jesse from Zoom, and during an attempt at recreating the Flash's original accident to restore his powers, she is bathed in dark matter energy. Barry is able to use the Speed Force to bring Jesse out of her coma, and she does not appear to manifest any special abilities. After Zoom is defeated in the season 2 finale, Jesse returns to Earth-2 alongside her father. She returned in season 3 as a speedster. Her super speed awakened due to the delayed effects of the dark matter, and her father was hesitant about her desire to become a superhero. Eventually, he's convinced after Jesse aids Flash in defeating Magenta, gives Jesse a new costume, and decides that the two should stay in Earth-1 for a bit for Barry to teach Jesse more about her powers. Eventually, Jesse returns to her world with her father to help protect it, essentially becoming a Flash under the name "Jesse Quick", to restore hope after Zoom has tarnished the Flash name on Earth-2 when he masqueraded under the identity. Later, she returns to request help from Team Flash as her father had been captured by Grodd and was being held captive in Gorilla City. After he is rescued, Jesse decides to stay with Wally West on Earth-1. When Wally gets trapped in the Speed Force, Jesse goes after Savitar and finds out that he's mortal after she finds a weak spot in his armor and weakens him. She then finds out that Savitar has plans for her and leaves Earth-1 for Earth-3 to take over for Jay Garrick while he's trapped in the Speed Force until Jay is freed and Savitar is defeated. In season 4, it is revealed that Jesse returned to Earth-2 after Savitar's death, and she builds a team of superheroes to combat the remnants of Zoom's followers and other criminals. However, she also breaks up with Wally due to their preoccupations. In “Enter Flashtime” it was revealed her mother died during her early childhood when Harry uses a telepathic device to tell her why he can't get over his wife's death. In Injustice 2, Jesse Quick appears in the Flash's ending, when Barry runs to the end of history through the Speed Force he's reached by other Speedsters, including Jesse Quick, ready to assist him in fighting a new, terrible crisis. ^ Beatty, Scott; Robert Greenburger; Phil Jimenez; Daniel Wallace (September 2008). The DC Comics Encyclopedia: Updated and Expanded Edition. Dorling Kindersley. p. 86. ISBN 978-0-7566-4119-1. ^ Conroy, Mike (November 2002). 500 Great Comicbook Action Heroes. Chrysalis. p. 187. ISBN 978-1-84411-004-9. ^ Beatty, Scott (November 2002). JLA: The Ultimate Guide to the Justice League of America. Dorling Kindersley. p. 47. ISBN 978-0-7894-8893-0. ^ "DC Comics Solicits for October 2010". First Comics News. July 19, 2010. ^ Evans, Chris (April 5, 2010). "WC10: Spotlight on James Robinson". Comic Book Resources. ^ ""The Flash" Casts Jesse Quick for Season 2". Comic Book Resources. Retrieved 2015-11-04. ^ Mitovich, Matt Webb (June 24, 2016). "The Flash Season 3: Jesse Will Return — But to What Reality? And With Powers?". TV Line. Retrieved 2016-06-24. ^ "Canadagraphs on Twitter". Twitter. Retrieved 24 October 2018. Country Boy is the seventh studio album by American country music artist Ricky Skaggs. It was released in 1984 via Epic Records. The album peaked at number 1 on the Billboard Top Country Albums chart. Don't Cheat in Our Hometown is the sixth studio album by American country music artist Ricky Skaggs. It was released in 1983 via Epic Records. The album peaked at number 1 on the Billboard Top Country Albums chart. It features guitar work from Albert Lee on five of the album's ten tracks and Dolly Parton harmonizes vocals on "A Vision Of Mother" and "Don't Step Over an Old Love". Hourman (Rick Tyler) is a fictional superhero who was created by Roy Thomas, Dann Thomas and first appeared in Infinity Inc. #20 as Rick Tyler, son of the original Hourman, who quickly joined Infinity Inc. as the second Hourman in #21 of that book. Johnny Quick is the name of two DC Comics characters, each with the power of superhuman speed. The first was a superhero who appeared mostly in More Fun Comics during the Golden Age. The other was a supervillain, an evil version of the Flash from Earth-Three, originally appearing during the Silver Age. The Golden Age hero has been mostly forgotten, apart from occasional flashback material, while versions of the Crime Syndicate Johnny Quick have continued to appear throughout the modern age. Kid Flash (Iris West II) is a fictional superheroine in the alternate future of Kingdom Come in the DC Comics universe. She first appeared in Kingdom Come #3 (July 1996). Liberty Belle is the name of three fictional superheroines. Two are from DC Comics: Libby Lawrence and Jesse Chambers, the other is from Charlton Comics: Caroline Dean.